System administrator can define [Billing Rate Type] as [Use Project Employee Billing Rate] to setup project based employee billing rate. Project based employee billing rate is useful for projects where employee billing rate is different for every different project. 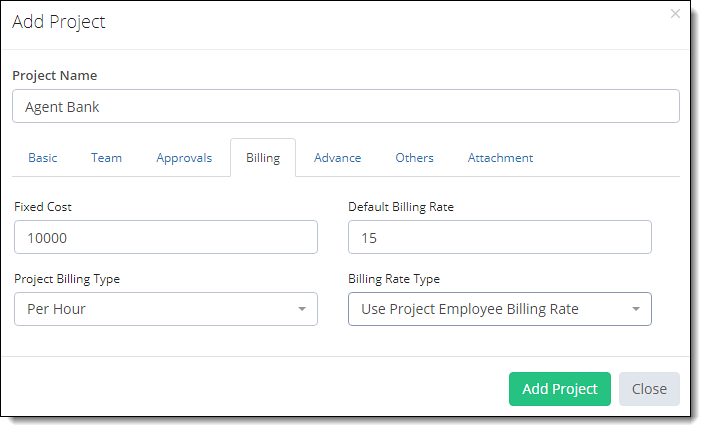 There are two steps for setting up project based billing rate in a project. Define [Use Project Employee Billing Rate] in [Billing Rate Type] when adding new project in TimeLive. On click on [Add] button, TimeLive will open a [Project Team] definition page where user can select project team required for this project with their billing rate. After selecting employees which are required to assigned in this project, click on [Update] to update these changes. Using billing rate history, administrator can add new billing record with its applicable date and he can also modify any of existing record also by clicking on [Edit] link.